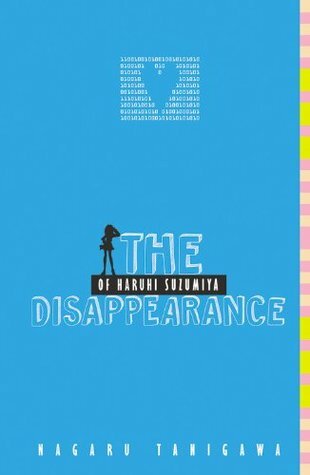 To date, this is probably my favorite of the Haruhi Suzumiya series. And a thought occurred to me that maybe I liked it the most because I haven't seen the anime movie adaptation yet and so I could be readily surprised for the strange twists and delighted by my own logical guesses as to those surprise twists. I don't know if this is why, but there's no way of knowing now, so I might keep this in the back of my mind. Aside from Harry Potter, Dean Koontz's Phantoms, and select few Michael Crichton books-made-movies, I'm not sure I've ever actually been able to enjoy a book to the fullest after seeing it made into a television series or a movie. Then again, that might be an excuse. The events of this book were exciting as Kyon is thrown into an altered timeline of the life he knew. There are no aliens, time travelers or espers, and Haruhi Suzumiya's emotions do not guide the happenings of the world like a God. And so it is his job to fix everything, of course, since he seems to be the only person who remembers the previous timeline of events before the alteration. It still ceases to amaze me at how intricately planned the story line of this entire series is set-up. Events happening in this book tie back to events from previous books that were miniscule enough that you don't think about them until they are brought up during the currently narrated timeline. Other events are being alluded to that I remember from the anime, but haven't quite yet taken place in the light novel series yet. Explanations take place that sort of make sense and sort of not make sense, but for some reason, I'm not concerned with the why's and how's since it all falls into place anyway. At least if Kyon has no trouble understanding what's going on and can kind of explain to me in his own narration what he understands, I'm not complaining. On an aside, Nagato Yuki is my favorite character in the Haruhi universe -- the quiet, stoic, unemotional, all-knowing, powerful alien being. Having her turned into a bashful, squeamish, and cutesy girl was kind of disconcerting, so I'm glad that our heroes fixed the timeline. And yet, even after all of this, she is still my favorite character in the Haruhi universe -- the alien being who does all the behind-the-scenes damage control whenever Haruhi's demands and desires get the best of her and Nagato must nullify outstanding changes in order for the world not to implode. Overall, while the previous two books were rather mediocre and monotonous, I'm glad that this one gave a nice mystery to solve including some exciting time-traveling and event-mixing. Very fun and the series is still as addictive as ever.